Prior to your surrogate’s first visit with her obstetrician (OB), she and you will have primarily worked with your fertility clinic, which will be very familiar with the surrogacy process. But your surrogate’s OB may have never experienced a surrogate pregnancy before and may not know what to expect. You and your surrogate may not know what to expect, either! We know how confusing this time can be, which is why we’ve answered some of your biggest questions about prenatal appointments in gestational surrogacy journeys below. The first OB visit generally occurs between 8 and 12 weeks of pregnancy. The surrogacy process won’t affect this first OB visit much, although the doctor may ask a few questions about gamete donors, if applicable. The surrogate’s health and vitals will be checked, and she’ll be asked a lot of questions to make sure her first trimester is going well so far. Your surrogate may receive a full physical, so you’ll need to step out and give her some privacy. Your surrogate will have her blood drawn to test for fetal abnormalities. There may also be a urine test, a pap smear, or other tests to check fetal and maternal health. A transvaginal ultrasound may be performed to evaluate early development. You may be able to hear the baby’s heartbeat. The doctor will review the next steps and schedule the next routine appointment. You and your surrogate will sign a lot of paperwork, usually HIPPA consent forms to release medical information. Most of this paperwork will be completed by your gestational carrier. The first visit to the OB consists mostly of the doctor asking questions, some of which may be rendered inapplicable as a result of the surrogacy process. This is usually an exciting time for surrogates and intended parents alike, so enjoy the moment together! You’ve probably already talked about this when you created your surrogacy contract together, but you’ll need to have an honest conversation with your surrogate about how much of your involvement she feels comfortable with during the pregnancy and about how much you’d like to participate, if possible. 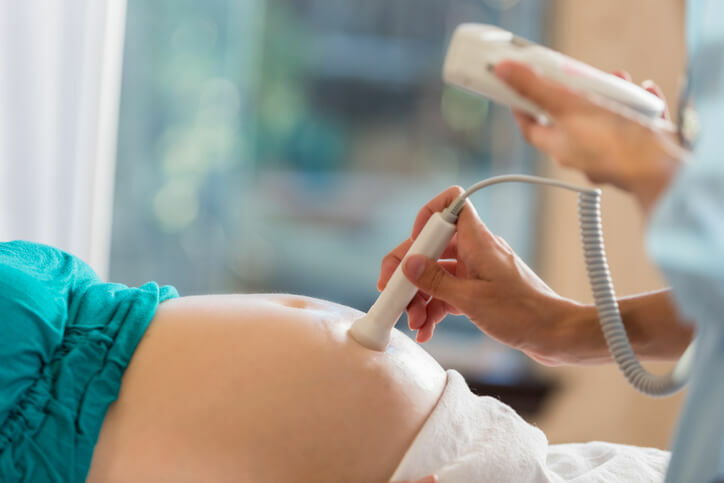 Not all intended parents accompany their surrogate to her first OB visit — maybe they’re unable to due to distance, or maybe the surrogate feels more comfortable going to this appointment without them. Regardless, you’ll have the rest of your child’s life to participate in important milestones, so missing the first OB visit certainly isn’t the end of the world. This may require leaving multiple messages, talking to several nurses and playing phone tag, but it’s important that everyone involved (especially the doctor who’ll be overseeing the surrogate’s care) knows about your surrogacy partnership, and is aware of everyone that will be attending the appointment. The OB may need to talk to the patient (your surrogate), as well as you, prior to this visit. If they’re prepared for intended parents and the surrogate, plus her spouse (or whoever might be attending the doctor’s visit), then they’ll be better prepared to do their own job of walking you through what comes next in your surrogate’s pregnancy. Not everyone at the OB’s office will be aware of your surrogacy partnership. Even those who are aware may slip up and say things that are insensitive. Try to be patient and understand that out of the many pregnancies this office sees daily, surrogate pregnancies are rare. Remember that you’re in this together with your surrogate. People may congratulate her on “her” baby or ask her unwelcome questions about surrogacy. Remember that both of you will likely be subject to uncomfortable moments, but that you’ll get through those moments together. Feel jealous that your surrogate is the one experiencing this visit with the doctor. Grieve that you’re unable to carry your baby. Be hurt or feel awkward when office staff ask questions or make assumptions about the baby’s genetic background. Feel frustrated that you’re not in control of the pregnancy and your baby’s health and protection. Be scared that you’ll lose the baby, especially if you have experienced previous pregnancy loss. These types of emotions are usually coupled with the excitement, joy and nervousness that is typical of parents in an OB’s office. If you need to talk to someone, remember that you can always turn to your American Surrogacy specialist for support. Surrogates have their own emotional support systems, but they’re doing this to complete your family. They want to make sure that you enjoy this appointment at the OB, too. Or simply telling her how excited you are and how happy you are to have her in your life. Seeing that you’re excited is what makes surrogacy worthwhile to surrogates! Remember that if you have any questions about the medical processes of surrogacy, including the upcoming OB appointments, you can always call American Surrogacy at 1-800-875-BABY(2229). Previous Previous post: Someone You Know Offered to Be Your Surrogate: How Do You Tell Them ‘No’? Next Next post: What Diet Rules Can I Make for My Surrogate?